Yay, we made it through our first week of school! I was so exhausted when I got home from school every day that after all the chores, I'd crash pretty hard and not get any tangling done. Tonight I forced myself to sit down and see what I could do with this week's Diva challenge, brought to us via Maria at Zentangle, using only Rick's Paradox tangle pattern. I knew that I would enjoy it. The first one I made was using a string that I had thrown on a tile a while back and had never done anything with it. Thank you Laura and Maria. You gave me a nice ending to my week. Now I'm ready for the weekend! Love your "pair of ducks"! 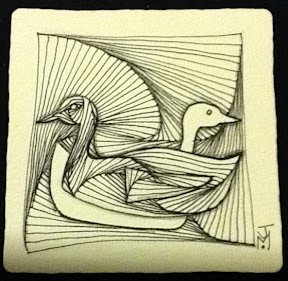 The ducks are so cute - and the tangles are both great. Hope your second week is a little less tiring. Congrats on the first week down - I share your relief! 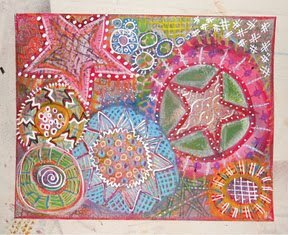 I found that I didn't have much time for tangling, either - a great loss, as it's something that occupied a lot of my summer time! My students love it, though - I've been sharing at least one new tangle a day with them and they're eating it up!